The much-loved "Avalon: Web of Magic "novels by Rachel Roberts get their first adaptation into manga for middle grade readers. Teenage mages, Emily, Kara, and Adriane have their hands full monitoring the portal at the Ravenswood Preserve. The portal has become the "Grand Central Station" of the Magic Web, with magical creatures and animals stopping by on their way to otherworldly destinations. But matters become really complicated when a new student, a handsome young warlock named Donovan, shows up at Stonehill High. When monsters start attacking Ravenswood looking for Donovan, the mages realize he may be trouble. But Donovan shows them what he has brought, a fairy map with the portal sequence that will lead the mages right to Avalon, the source of all magic. Rachel Roberts is the author of Avalon: Web of Magic, including Secret of the Unicorn, Cry of the Wolf and All That Glitters. 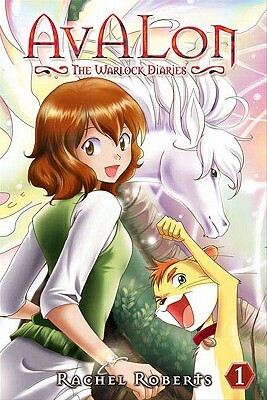 The Warlock Diaries is her first manga work. Roberts, who lives in Southern California, enjoys meeting her readers.Shiei is the artist for Aoi House. She is the most prolific Original English Language manga artist in the US, having completed 4 volumes of Aoi House and 5 volumes of Amazing Agent Luna so far. Shiei resides in Southern California.